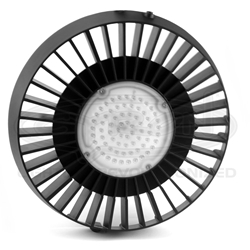 LED Highbay light with a cool hi-tech image. Cyron HB100 replaces a traditional 125 watts Metal Halide high hat light in all industrial and commercial applications. With such a high tech design it can also add decor to high ceiling residential flats, studios, airport hangers, production facilities, retail stores, gymnasiums, and any other place that is looking for more than a bunch of "cones" hanging off the ceilings. Offered in perfect balance of white 4000K neutral tone that is neither too yellow nor too blue. Long lasting with up to 27 years of life. Installed this highbay light myself and it was super easy to set up. On top of that, it looks great while not costing me a fortune. My contractor installed your high-bay light in my warehouse. Looks great and I receive many compliments on LED Lighting.